Scientists have long studied the possibility of water on Mars, analyzing evidence that suggests liquid water existed on the Red Planet in the past. Recent evidence of gullies formed within the last decade raises the possibility of liquid water on or near the surface. These findings are incredibly significant, because where there’s water there may be life. Billions of years ago, Mars was warmer and wetter. Current theories suggest a thicker atmosphere along with warmer temperatures allowed groundwater to remain unfrozen near the planet’s surface. There were great rivers, lakes and even an ocean. If Mars had a thicker atmosphere, the greenhouse effect — the process by which an atmosphere warms a planet — would have caused the entrapment of more solar heat. 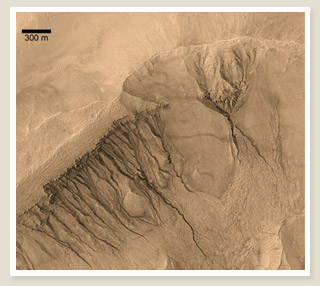 Evidence for groundwater seepage has been debated by research teams investigating the formation of gullies on Mars. While some support the hypothesis that groundwater has created the gullies, others believe the gullies are a result of brines, carbon dioxide, snow melt, geothermal activity or dry flows of windborn dust and silt. More clues supporting the past existence of water on Mars are found in sedimentary rock layers found on Mars. Analysis of layered rocks revealed the presence of sulfates and other minerals that form in the presence of water. While scientists have concluded that Mars, like Earth, was once a watery planet, there is little evidence to support the existence of liquid water today. It is now a frozen, dry planet. Having developed a thin atmosphere, Mars never has rain—water vapour in the air evaporates or becomes unstable. With a reduced ability for greenhouse gases to trap solar heat in a thin atmosphere, Mars is now too cold for abundant liquid water on its surface. Some of the water that used to exist on Mars has seeped into the ground and become subsurface ice. We’ve long known there are layers of carbon-dioxide and of water ice at the planet’s poles. Yet there is also new evidence for a vast frozen sea that lies just beneath the surface, protected from melting by a layer of volcanic ash. Although it never rains on Mars, it is thought that carbon dioxide condenses to form a fine “snow” during the planet’s polar winter. Why would a once watery planet turn into an icy desert? And how long has it been since liquid water was present in abundance on Mars? In studying glacial deposits on Mars and seeking more clues about the planet’s watery past, scientists may begin to solve these puzzling questions. They will also learn valuable information about climate change, a subject of increasing concern on our own planet. And of course, the more we know about the presence of water on Mars, both in the past and today, the more we will know about whether or not life is (or was) a possibility there.